Even it’s not yet visible to forever blind people (turned blind after beeing slamed by marketing noise ! ), and even if the Vanilla project still suffer from the low investment of its promoter in the media (dont forget we want to keep Vanilla Open Source, which means we are not willing to follow the us marketing companies in terms of marketing campaign! ), Vanilla v4 is a true real success. Number of download is above our expectation (more than 350 downloads in 2 weeks, including more than 95 full server & designers download) and message sent by developer are really nice. Number of declared bugs is really minimum : as date of this writting, we fixed a Java7 Vanilla version, and all other declared bugs are cosmetics enhancement. There was also some issues in relation with database type for repository (example with postgresql, to manage external Url), which has been fixed at database level. As we have improved our internal methods to delivere version 4 (compare to version 3), we are really happy with the result, and we believe we have found methods and people to apply our strategy in term of version management. Deployment of version 4 has started for some of our customers, under control of our integration team. New partners have joined us, and important to notice is the size of the partner : new large system integration have adopted Vanilla, not specialised in Open Source or Bi, but simply looking for a ready-to-use Bi platform to use in request for proposal (Trend, Bid … name can change). Something usefull with Vanilla v4 is the possibility to manage weight for requests, and prevent the request to be issued against the database – based on predefined rules – if the weight exceed the predefined limit. 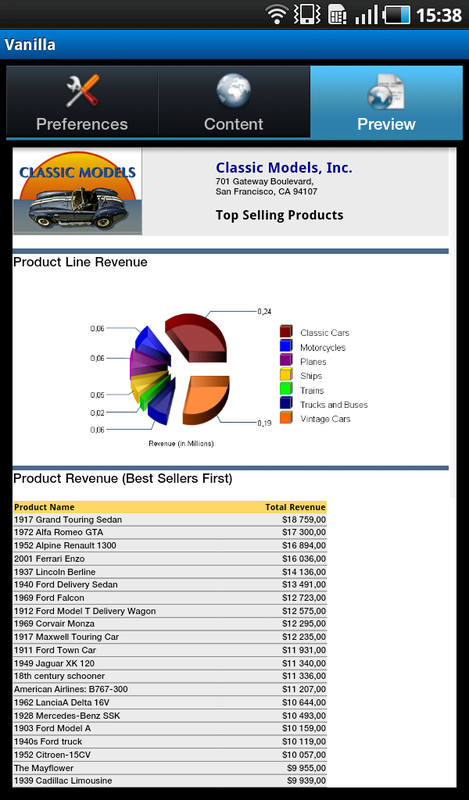 Using FreeWebReport, user are able to build complex report that contain crosstab elements and various grouping strategy. Some user need “assistance” when it comes to build complex reports, and sometimes, putting too many element in a report is not effecient. Purpose is to stop the request a user may raise before it goes to the database if Bi admin think the request is too heavy (simple example : too many tables in the sql statment). Each table in the Metadata document is set with a predefined weight. We all understand its not a database admin feature, but more a datawarehouse features : tables have different behaviour – fact tables, dimension tables, aggregate table – different number of records and different index strategy. 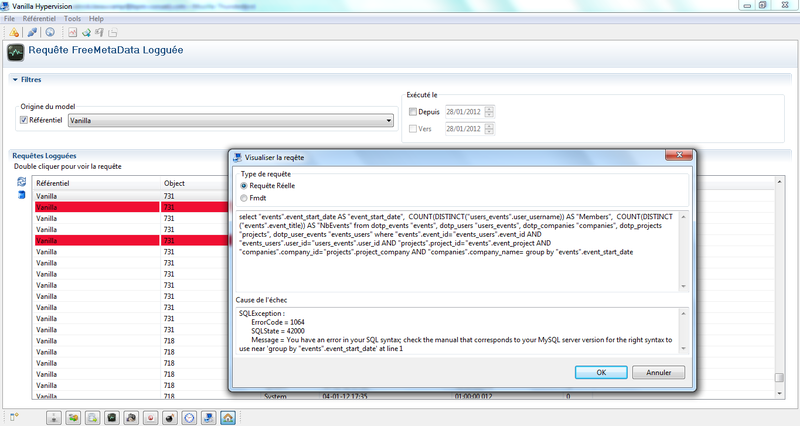 – Using Enterprise Services, each group of the Vanilla Group Table is set with a global limit. – When a user run a request, the Vanilla platform calculate the sum of weight for all the tables included in the requests. If the sum is superior to the limit set to the group, the request is stopped and a message raised in the interface. 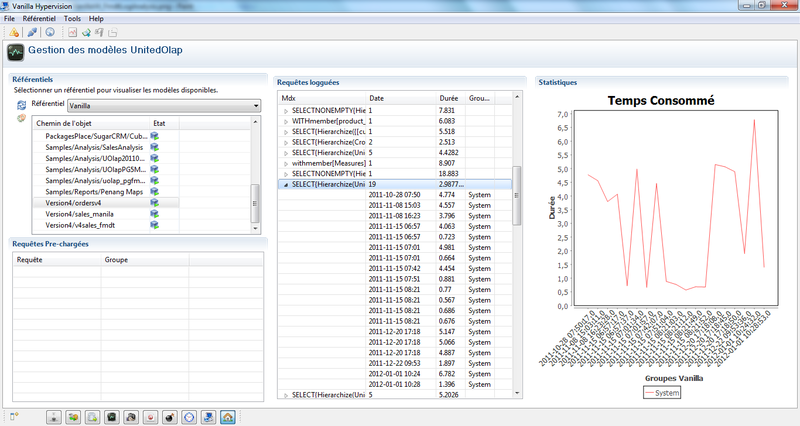 Something interesting with a Bi platform is the presence of audit function to analysis the query issued through the platform (to any kind of destination, such as sql database, olap database …). This post is the first of a serie talking about Audit, Performancance Audit & Platform Management. 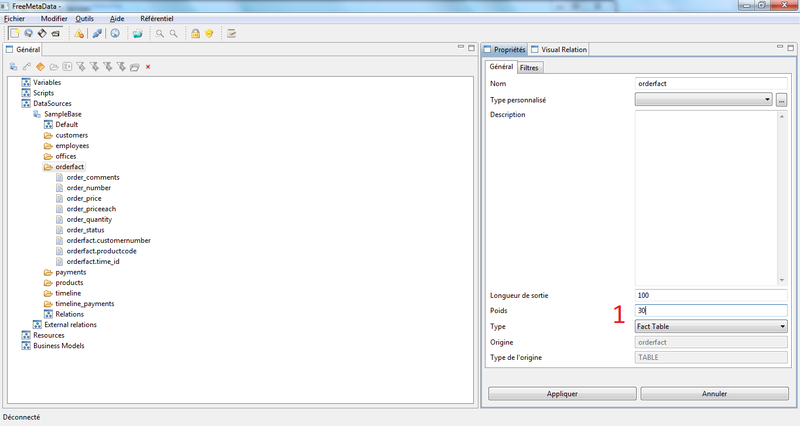 With Vanilla, using Enterprise Services (an Open Source … thanks to the French Government initiative ! 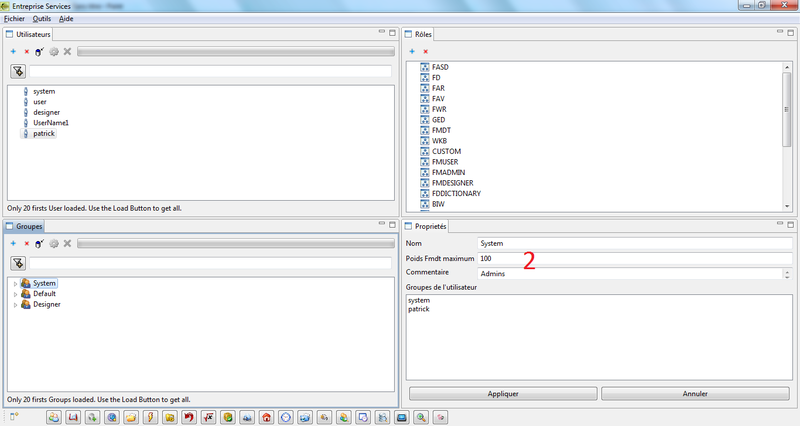 ), you can easilly control the different requests issued – per report & per group of user – using the Audit Perspective. Usage is so easy : you select one or more reports from the repository treeview – zone 1 – and drag & drop those reports in zone 2. 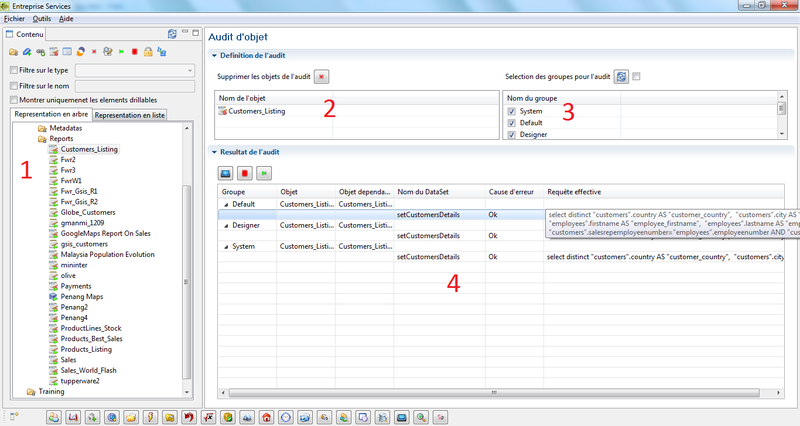 Then, you select the groups for which you want to audit the different request statment – in zone 3. Zone 4 of the image is the result : you can easilly view for a specific report the differents statments per groups, then control your security policy, detect a mistake in your Metadata join strategy, or even seea “no statment issued” if the group is not allowed to issue the request that built the report. 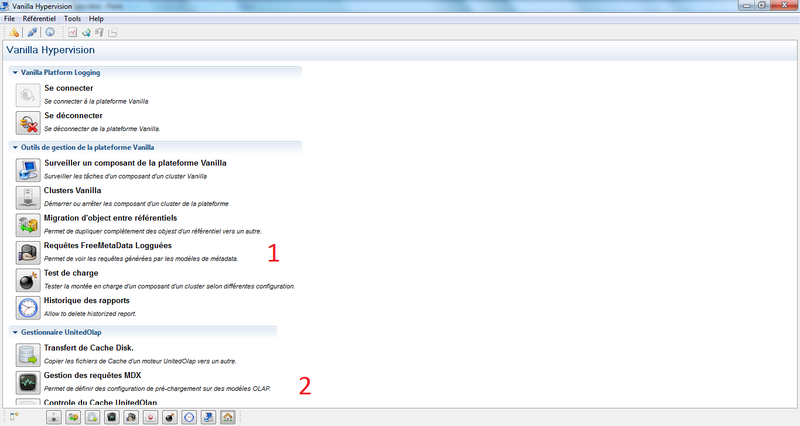 Vanilla is Cool … and support from Bpm-Conseil is Great ! Over the last few days, I gave some Vanilla presentation to potential customers and potential system integrators. Its always nice to receive real-time feedback … especially when the feed-back is good, and that’s the situation after Vanilla presentation. Based on their previous professional experience with commercial products, attendees focus more on the Bi area (if they have experience with commercial product, they always like FreeMetadata, and our Designer (Reporting, Olap, Dashboard, Kpi) have also great recognition), on Etl area (they like the integration with the Bi side and with our workflow, the clean usable interface (not an old fashion Ide interface), on workflow area (they like again the integration with the Bi side, integration of Bi resources, support for different forms engine and visual deployment of Workflow) and even on document management area (indexation of Vanilla reports with access to an integrated search engine is a must !) … everyone with an experience of a commercial product find himself immediatly confident with Vanilla modules, its really a great message and great indication for the Vanilla Team : we meet our public ! Those who still confuse Open Source & Free, joined by those who confuse the natural motivation from Bpm-Conseil to help on first demands, may disagree with this … well, every game has a limited time, and we all need the same rules, right ? pre-sale is not support without limit, I’m not shy to claim we are in Open Source area, I’m not shy we are also doing business, to invest on further development and to maintain a support team. Vanilla & Analysts – Triple A ! Those who already read my previous posts know already I dont take attention to commercial & marketing “analyst firm”, like the “.G” company (at least, without telling about the whole company activity, I focus on the Bi marketing hero who run analysis by sending survey to editors … those editors are filling the answers themself … Great Summer student Job). This has led to “analyst results” completly out of the reality (you can just read some comment about their first Open Source study, and the same ‘study’ one year after !!! )… who take benefit of this ? As opposed to .G, I will mention Forrester … because we had clear exchanges with the Bi Analyst. He did a great job, and is open to discussion. Our view of the situation may be different, because we have different position and are running different objectives, but at least, communication is “On”. You may have heard France has just lost its AAA rating (1 Analysts firm only … which lead to more confusion) … well … who are the person who issue rate ? What do they know of France ? Our way of life, social security, retirement funds, security, safety hospital & good education … we are building our next generation of winner, in peace. We dont have to focus on those US notation for our long term situation … even if this event will have direct impact on some financial subject.